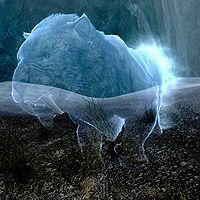 The Sabre Cat Guardian Spirit is a spectral sabre cat located at the base of an ice wall. Despite being spectral in appearance, the guardian spirits seem to retain all aspects of their represented species and are killable with normal weapons. They leave behind ghostly remains, but the loot table matches their represented species as well. It will not appear until you are actually on the part of the quest that asks you to hunt it. This page was last modified on 28 August 2013, at 04:26.